Product information "Brazed Fins Heat Sinks"
Not always does one of the many extruded, monolithic standard aluminium profiles meet the requirements of a very special heat dissipation project. 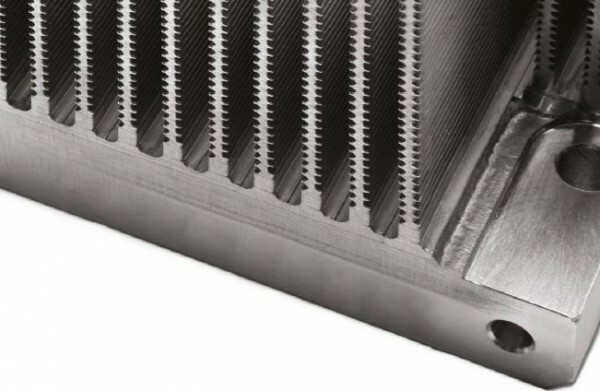 Therefore, a production technique in which a basic carrier profile is fitted with cooling fins using brazing technology offers particularly flexible possibilities for manufacturing a customer-specific heat sink. Depending on the requirements of the project, different alloys can even be used without the limitations typical of extruded profiles. There is no need to design and manufacture new extrusion dies, nor are there any restrictions on size, overlong delivery times or minimum order quantities. This technology offers maximum flexibility and short response times in prototype and series production. Contact us or send us a request for a comprehensive consultancy for your custom brazed fins heat sink solution. Related links to "Brazed Fins Heat Sinks"
Customer evaluation for "Brazed Fins Heat Sinks"